You may think that meditation would be good for you, but perhaps you don’t know how to start, or don’t think you can do it. Or, you may have tried a particular method that didn’t work or you didn’t like. This class will show you that there are many ways to meditate, and that you can pick the one that fits best for you. Meditation can be long or short, still or using movement, quiet or using sound. It can be practical – for health and well-being – or spiritual, or both. This class will provide some history of the practice of meditation, and will give participants the chance to try several different meditation methods, to see which one(s) feel right for them. No previous experience with meditation is necessary. Moving from the inside out. We often think of meditation as something done while sitting still. But movements, even small ones, can bring health, pleasure and peace as part of a meditation practice. This workshop is for everyone – whether you love to dance, or just want to wiggle your fingers and toes. No experience or specific abilities necessary. We’ll use music and quiet, meditative states to find your best ways to move. You will have the chance to create your own personal movement plan to take home with you. Bring your dreams & hopes, issues & challenges. A time of meditation will be followed by a chance for each person to share their current steps on the journey to wholeness. 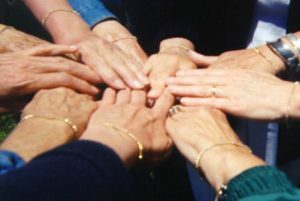 All sharing is received in caring silence, as the group acts as loving witnesses to what each person chooses to share. People of all beliefs are welcome. Developed by Layla’s spiritual mentor, Gwendolyn Jansma, this ceremony is an opportunity to prepare and pledge to study one of the four sacred elements – earth, air, fire and water – for three years, three months, three weeks, and three days. The ceremony includes creating a prayer arrow and choosing a God/Goddess to guide your journey. This is a beautiful and meaningful way to bring spiritual awareness more fully into your daily life.